Berserk is a Black Metal band from Spain that consists of Nazak (vocals), Forjstorm (guitar), Lord Monk (bass), and Frozen Wind (drums). Formed in the mid to late 90’s Berserk have released one demo and a full-length called …From The Celtiberian Woods, which was released in 2001. 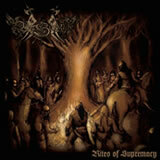 So thus Berserk return in 2003 with Rites Of Supremacy, which by all accounts is one of the more original Black Metal CDs from a lyrical perspective in some time. Berserk’s brand of Black Metal can be described as a somewhat laid back, melodic, and atmospheric style with touches of folk. The band rarely gets overly aggressive or violent, but instead they concentrate on dark and mesmerizing soundscapes, from which comparisons to Primordial could be made. The tempos are mostly mid-paced and the overall song arrangements are somewhat epic, as most songs are over the 6-minute mark. This isn’t a band out to crush skulls but instead, like Primordial, try their best to engross the listener in a powerful listening experience that is drawn from mesmerizing guitar riffs, subtle keyboards, and repetition. Yes, Berserk do repeat their riffs longer than most bands, though this isn’t uncommon in Black Metal (see Darkthrone) and these bands actually do it on purpose. Berserk isn’t always successful in this regard but when you really get into the music the repetition almost puts you into a trance and you start to hear every little detail and you’re eventually hooked, which I would surmise was the bands intention. The riffs and some keyboard parts are semi-folkish in nature and this adds a nice dynamic to the music as it makes the songs catchier than they otherwise would be. The vocals from Nazak are also quite good. His Black Metal style is a lot more mid-range than is typical of bands like this and the result is successful, because not only are the vocals well done but also it’s refreshingly different. What I like most about the vocals, though, is the pacing in each song. The vocals always fit the mood of the music and compliment the instruments quite well, also, occasional clean vocals are used, which while being perhaps more typical in execution are nevertheless a welcome addition that gives some versatility to the bands sound. Production wise the sound is somewhat raw but shouldn’t turn off casual Black Metal fans, as everything can be heard and even the bass is sort of upfront for a Black Metal band, in fact, the bass adds extra atmosphere as it’s used for a more than rhythm and bottom end on more than one occasion. Likewise, drummer Frozen Wind uses some offbeat snare hits and atypical patterns that helps to prevent the guitars from droning too long; plus the ever popular double bass is used tastefully and is not overdone. Of course, I can’t forget to mention the lyrics, because to me, this is a main draw of the band. Obviously most Black Metal bands revolve their topics around Satanism, Nordic traditions, or just plain evil thoughts, but there are always exceptions, and Berserk is one of those rarities. By now, most of us, to some extent, are familiar with bits and pieces of Nordic history but what about Spanish history around the time of the Romans? Spain was no stranger to being overtaken by the Romans and the result was the abolishment of Celtiberia, which was the term used by the Romans to describe the northeast portion of Spain. While this hasn’t actually been completely proven from the readings I’ve done, Celtiberians were called such because they were thought to be descendents of Celtic immigrants who came from Gaul. So in short, Berserk is tackling ancient Spanish traditions and Pagan ideals, which while perhaps being similar to what most Norwegian bands do to a certain regard, it should still be applauded for being something different. I definitely enjoyed this release and fans of Primordial should check these guys out. While Berserk do not use their clean vocals or acoustic guitars as much as Primordial do, the similarities are still there; in comparison, Berserk is more rooted in traditional Black Metal as well. Rites Of Supremacy perhaps won’t be aggressive enough for some, and some people just won’t get into the music no matter how hard they try but give them a chance. However, I must say some sections in a couple of songs left me a little indifferent and song arrangements seemed too familiar at times but if I look forward to hearing Berserk evolve as they have a lot of potential.